Once upon a time, the Mughal Emperor Jahangir was traveling in the far north of his domain. After several weeks of arduous travel, his expedition reached what is now Kashmir Valley. He was awestruck at first glimpse; he could hardly believe that a place so beautiful beyond compare could exist in this world! Silent and still, with an undercurrent of stirring life, Kashmir captivated him. Spontaneously, he uttered this Persian couplet – “Gar Firdaus, ruhe zamin ast, hamin asto, hamin asto, hamin asto” meaning “If there exists heaven on earth, it’s here, it’s here, it’s here”. The rest is history. While it was Kashmir’s natural wonders that ensnared Jahangir, he may as well have been speaking of the local Kashmiri food. Every fan of Kashmiri cuisine will be quick to repeat his words verbatim! Can any vision of heaven be complete without mouth-watering dishes to indulge in? As a lucky traveler will soon discover, Kashmir is not only a haven in the lap of the Himalayas but also offers an enormous range of exotic delicacies. Perfected over the centuries, the best Kashmiri dishes blend Brahmin Pandit-Mughal-Afghan-Persian-Tibetan influences into one incomparable cooking style. The traditional food of Kashmir is rich in luscious meats, fragrant with rice and redolent of herbs and spices. What makes Kashmiri cuisine so appetizing? Known fondly as “Zaeka-E-Kashmir”, or taste of Kashmir, authentic dishes of the Kashmir Valley are today enjoyed across the country. From mild to sizzling, the Kashmiri palate is quite diverse. If a dish has the following features, you can safely mark its recipe as “Made in Kashmir”! Dry fruits: Lashings of dry fruit over lip-smacking dishes entice many a diehard food lover to eat more than their stomachs can hold! Ghee: Aromatic, exquisite meat or vegetables swimming in ghee: doesn’t that conjure a mouth-watering mental image? Kanti (small chunks of meat cooked with a lot of onions). Let us explore these traditional Kashmir dishes in yummy detail! I will start with the non vegetarian Kashmiri dishes and provide a little more details on all of the above. Arguably the single most famous food of Kashmir, Rogan Josh is an iconic lamb curry introduced by the Mughals. No lamb lover can pass up a plate (or several!). A robust meat preparation served with naan or rice, Rogan Josh is a staple at every Kashmiri dinner party and special occasion. Soft, succulent lamb meat is first marinated in yogurt. Then, it is cooked with browned onions and spices with the Kashmiri red chilies adding a final dramatic touch. The liberal use of these local chilies is what gives Rogan Josh its blistering red color. 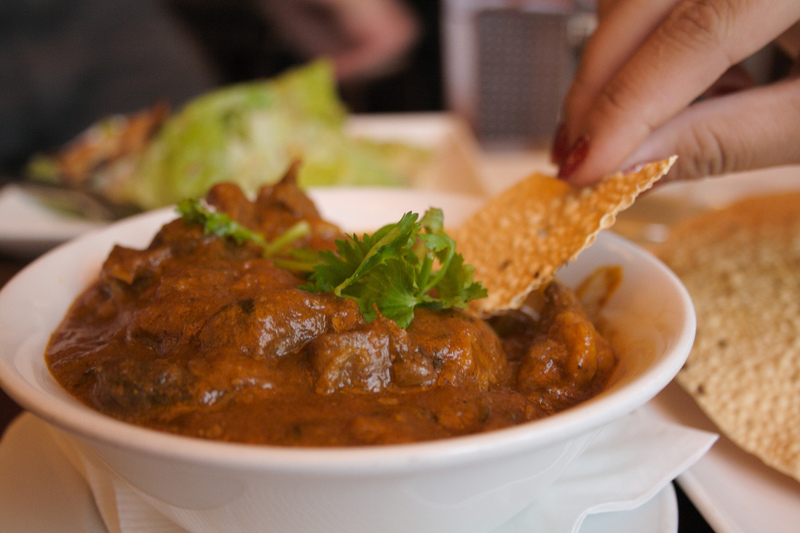 Contrary to popular opinion, Rogan Josh is a low-fat dish, and easy on the stomach. The yogurt which forms the base of the dish balances the fire in the spices. A traditional delicacy of Kashmir, Goshtaba is minced mutton cooked in flavorful yogurt gravy and spices. This dish is prepared on royal occasions and it indeed has a royal taste and flavor which can tease you appetite to urge for more. It earns its reputation as a dish for the aristocracy. Rista is a mouth-watering, famous dish of kashmiri wazwan. It is similar to Gushtaba. Rista too are meatballs but with red curry. It is prepared in red chilly powder and other spices in a very special manner. It is a delicious culinary delight with a ladeful gravy to be enjoyed with naan and cumin rice. The crowning glory of Kashmiri Muslim culinary tradition is the multi-course royal meal, called Wazwan. This captivating dish may consist of nearly 36 courses, most of which are meat based. The dish takes its name from two Urdu words: “Waza” (meaning chef) and “Wan” (meaning shop). Fittingly, the dish is prepared by a team of chefs known as “Wazas”, who assist the head chef or “Vasta Waza”. Most dishes in the Wazwan require incredible precision and overnight cooking. Such is the Wazwan’s importance in local culture that the art is passed on from one generation to another, and trade secrets are not shared with anyone outside of the family. Every significant occasion or celebration in Kashmir is incomplete without the Wazwan, and the chefs invited to prepare these dishes command great respect and awe. How does one dig into this impressive, aristocratic dish? First, an attendant comes around with a jug of water so that the guest can wash their hands. Then, the dishes are served in a sizeable copper plate, each of which can serve up to four guests. Heaps of rice are served up with a succession of sheek kebabs, barbecued ribs, kormas accompanied by dips, chutneys and yoghurt. This is a meatball dish prepared in red chilli gravy. This dish is the best example of the words “fatal attraction”. It bewitches your senses, but this dish is not for the faint-hearted! Eat a bowl of Matschgand with jeera rice. If you dare, that is! This is the best example of comfort food which Kashmir can offer. Lamb is cooked to perfection in an onion-yoghurt gravy and then seasoned with green and black cardamom, dry mint and aromatic fennel. The standout ingredient is the rare Mawal flowers, which impart a unique taste. Pair a bowl of Yakhni with fragrant Kashmiri rice and you’ll have a combination worth remembering! In a land of lamb, chicken and beef dishes, this one stands out. A festival fish preparation is served mostly in December. Fish, radish and lotus stems are deep fried in a gravy of ginger and fennel. Then, local herbs and spices are added to searing effect! This one can truly warm you up during freezing winter! The vast majority of Kashmir kitchens simply cannot function without mutton. In fact, some of the best Kashmir dishes are mutton based. One of these is the Aab Gosht. Although it is of Persian origin, nearly 30 local variants exist today. Here, lamb is cooked in milk and spices to great effect, with black pepper and cardamom adding the final yummy touch! These mutton ribs count among the best food in Kashmir. They are prepared with spices and milk, wrapped in a batter of gram flour and fried golden. Beats KFC any day, right? Every region in India has a variation of the classic Chicken Pulao but the Kashmiri version stands alone. Fragrant rice is redolent with rich spices and juicy chicken chunks, seasoned with ghee and Kashmir chillies for that perfect balance. Want a break from creamy Kashmir dishes and curries? Then try the Dhaniwal Korma. This mellow curry takes its name from the liberal use of coriander leaves. Essentially, it is a yoghurt marinated meat dish fragrant with cardamoms and cloves. Here, lamb ribs are deep fried with chillies and salt and then stuffed full of spices. A dish to satisfy any gourmet! Now let me provide some informaiton on vegetarian Kashmiri dishes listed above. Think Kashmir dishes are all about meat, meat and more meat? Think again! One of Kashmir’s most famous food exports is the Dum Aloo. Simple and satisfying, potatoes are fried golden and then cooked in yoghurt. Fennel, ginger powder and Kashmiri chillies are added to get a spicy curry. Usually served with naan, rotis or rice, this dish can make anyone weak with hunger! This dish owes its origins to the Kashmiri Pandits and is a staple in Kashmiri kitchens. In fact, it is a rare but popular option here in this land of confirmed meat lovers. Try this lip-smacking paneer (cottage cheese) curry prepared in a creamy base of spices and yoghurt. Turmeric is the key ingredient which imparts the exotic yellow color, while the yogurt mellows the sharp spices. Another hearty paneer dish, this time cooked in milk and sprinkled with spices till it turns a gentle, earthy brown colour. An iconic Kashmir vegetarian dish, it is also one of the simplest and fastest to prepare. A quintessential part of winter cuisine in the valley, spinach is cooked in mustard oil and seasoned with red chillies and garlic. A perfect accompaniment to piping hot rotis. The humble eggplant is fried golden and transformed into a thick, scintillating gravy. It is a popular side dish at most Kashmiri feasts. This is an offbeat dish with crunchy fresh lotus stems being the main ingredient. They are cooked with yogurt and infused with ginger, cardamom and bay leaves. It’s a relatively mild dish but packs in an underlying tangy taste which sneaks up on you! Kashmir food incorporates quite a few rare ingredients, found only on the remote Himalayan slopes. Many of them such as Saffron were highly prized through the centuries and lured merchants from the Silk Road and as far as Europe! This dish incorporates one such rare ingredient – the Morel, a species of mushroom. Such is its value that an ordinary Kashmiri household may taste it only during a very significant occasion, such as a marriage. It’s scarcity, cost and uncommon flavor have firmly cemented it as a royal dish. The most important step is to clean the mushrooms without flaking away from the top layers. Then, mushroom pieces are added to white rice and garnished with fennel, black cumin, ginger powder and mustard oil. Tangy and fiery at the same time, this is another eggplant dish, prepared with gusto throughout the year. The signature component is the tamarind water which offsets the warmth of the spices. Mentioned below are some sweet dishes that you must try while visiting Kashmir. Kashmir dishes do not include many sweets, but the few sweet dishes pack a punch! One such dish is the Modhur Pulao. This dessert is essentially a rice dish sweetened with sugar. Ghee, milk, cashews, almonds, cardamom and of course saffron give it the distinctive taste and wondrous color. This tender but delectable pulao is a welcome after all the hot meat dishes. Pineapples, pomegranates, walnuts, cashews, almonds are added to fragrant Kashmiri rice to get a mild, sweet dessert dish. Five minutes are more than enough to prepare this sweet and sour chutney. Crushed apples and raw mangoes are garnished with yoghurt, nuts, cardamom and the ever-present saffron for a delicious blend. It works magic as a side dish or dip. Last but not the least, listed below are a couple of local drinks that you can have a sip of in Kashmir. This traditional salt tea is common to Kashmir, Ladakh and Himachal Pradesh. In Kashmir, this tea is consumed a minimum is 2-3 times a day. Made with milk, black tea, salt and bicarbonate of soda, it’s a classic breakfast drink to accompany freshly baked bread. Known in villages as “Mughal Chai’ and in the towns as “Kahwah”, this green tea is prepared with powdered almonds, walnuts, spices and saffron. It is customary to serve Kahwah at festivals, occasions and religious events. Today, more than 20 different ways to prepare Kahwah are in existence, so it is likely that every cup you drink will be different! The list I provided above are just a few from a long list of mouth watering dishes that Kashmir has to offer. I am sure there are many more food items that will leave its taste on your toungues for days to come. I hope the information above was of help. If you have any questions; please feel fee to ask in the comments section below; or at our Community Forum; and I will be glad to answer.